Keeping a Tripawd safe on slippery floors is a big deal around here, and for good reason. At best, one fall can quickly ruin a new Tripawd’s confidence. At worst, one bad slip can cause injury. Add traction for your Tripawd. 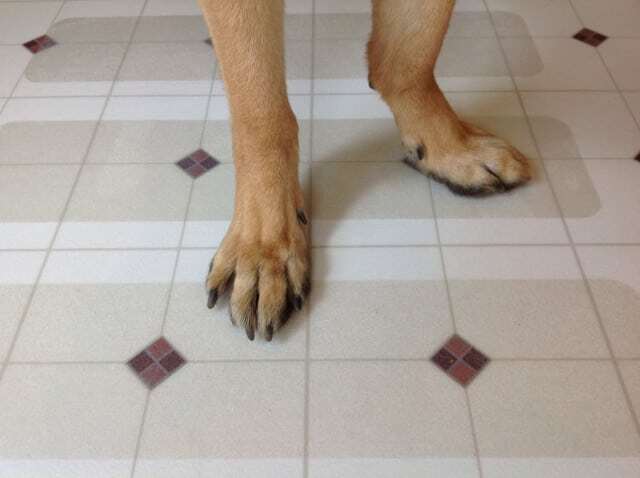 Slippery floors are one of the scariest parts of a Tripawd’s life, which is why we’re always looking for better ways to add traction to slick surfaces. If you’re tired of placing no-slip throw rugs everywhere, check out this new indoor traction decal called “Puppy Treads™,” by Handi-Ramp®, the world’s oldest ramp manufacturing company. Puppy Treads are an adhesive-backed, affordable decal that installs on interior surfaces without any tools. 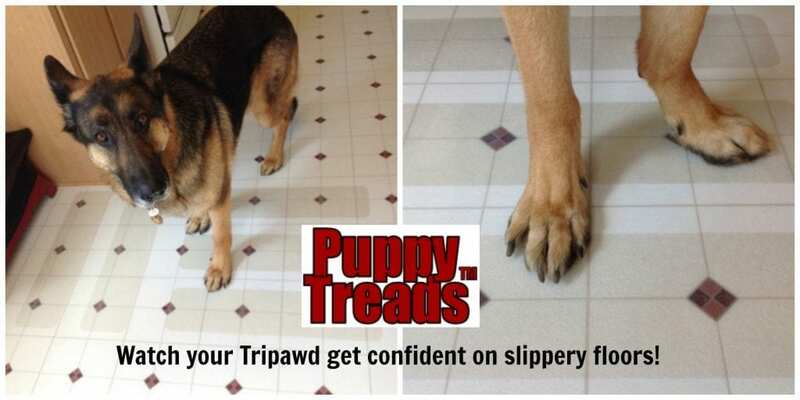 Use them on stairs, in the kitchen, or on any interior surface where your Tripawd roams. This is an easy product that anyone can apply to their floors. They’re manufactured and distributed by the HandiRamp company, which has been making accessibility and safety products in the U.S. for over 50 years, so you know they’re safe. Protect your Tripawd from falls that could cause injuries. Boosts confidence when re-learning how to go up and down stairs. Makes it easier for a three-legged dog or cat to walking across slippery floors. They’re as easy to install as the company claims. You don’t need any special tools but it helps to have a rolling pin to put extra pressure on them when adhering to a clean surface. Tip: Know exactly where you want to place the treads. Once you lay it on the floor it will stick. We tried to reposition one and it tore — the treads have an incredible adhesive on the back! They will peel up for repositioning and removing, but with effort. If you want to remove them at some point in time, it may be a chore and could potentially leave residue. However HandiRamp says any gunk can be easily cleaned with an adhesive removal product. Conclusion: Puppy Treads are worth a try, especially for indoor stairs. Click here to order Puppy Treads. Just ordered these for my stairs. Unfortunately, the coupon is expired. Thank you, we have updated this post.